You've heard the mantra over and over - there are no safety concerns associated with genetically engineered crops. That refrain, music to agrichemical and biotech seed industry ears, has been sung repeatedly by U.S. lawmakers who have just passed a national law that allows companies to avoid stating on food packages if those products contain genetically engineered ingredients. Sen. Pat Roberts, who shepherded the law through the Senate, dismissed both consumer concerns and research that has fed fears about potential health risks related to genetically engineered crops, in lobbying on behalf of the bill. "Science has proven again and again that the use of agriculture biotechnology is 100 percent safe," Roberts declared on the Senate floor on July 7 before bill passed. The House then approved the measure on July 14 in a 306-117 vote. Under the new law, which now heads to President Obama's desk, state laws mandating GMO labeling are nullified, and food companies need not clearly tell consumers if foods contain genetically engineered ingredients; instead they can put codes or website addresses on products that consumers must access for the ingredient information. The law intentionally makes it difficult for consumers to gain the information. Lawmakers like Roberts say it's okay to cloud the issues for consumers because GMOs are so safe. But many consumers have fought for years for foods to be labeled for GMO content precisely because they do not accept the safety claims. Evidence of corporate influence over many in the scientific community who tout GMO safety has made it difficult for consumers to know who to trust and what to believe about GMOs. "The 'science' has become politicized and focused on serving markets," said Pamm Larry, director of the LabelGMOs consumer group. "The industry controls the narrative, at least at the political level." Larry and other pro-labeling groups say there are many studies indicating that GMOs can have harmful impacts. This week, the French newspaper Le Monde added fresh reason for skepticism about GMO safety claims when it unveiled details of University of Nebraska professor Richard Goodman's work to defend and promote GMO crops while Goodman was receiving funding from top global GMO crop developer Monsanto Co. and other biotech crop and chemical companies. Email communications obtained through Freedom of Information requests show Goodman consulting with Monsanto frequently on efforts to turn back mandatory GMO labeling efforts and mitigate GMO safety concerns as Goodman conducted "scientific outreach and consulting on GM safety" in the United States, Asia and the European Union. Goodman is but one of many public university scientists engaged in such work. Similar collaborations have been revealed recently involving public scientists at several universities, including the University of Florida and the University of Illinois. Cumulatively, the relationships underscore how Monsanto and other industry players exercise influence in the scientific arena of GMOs and pesticides to push points that protect their profits. In its examination of those concerns, the Le Monde article shines a light on how Goodman, who worked at Monsanto for seven years before moving to the public university in 2004, came to be named associate editor of the scientific journal Food and Chemical Toxicology (FCT) to oversee GMO-related research reports. Goodman's naming to the FCT editorial board came shortly after the journal angered Monsanto with the 2012 publication of a study by French biologist Gilles-Eric Séralini that found GMOs and Monsanto's glyphosate herbicide could trigger worrisome tumors in rats. After Goodman joined the FCT editorial board the journal retracted the study in 2013. (It was later republished in a separate journal.) Critics at the time alleged the retraction was tied to Goodman's appointment to the journal's editorial board. Goodman denied any involvement in the retraction, and resigned from FCT in January 2015. The Le Monde report cited email communications obtained by the U.S. consumer advocacy group U.S. Right to Know (which I work for). The emails obtained by the organization show Goodman communicating with Monsanto about how best to criticize the Séralini study shortly after it was released "pre-print" in September 2012. In a Sept. 19, 2012 email, Goodman wrote to Monsanto toxicologist Bruce Hammond: "When you guys have some talking points, or bullet analysis, I would appreciate it." Emails also show that FCT Editor in Chief Wallace Hayes said Goodman started serving as associate editor for FCT by Nov. 2, 2012, the same month the Séralini study was published in print, even though Goodman was later quoted saying that he was not asked to join FCT until January 2013. In that email, Hayes asked Monsanto's Hammond to act as a reviewer for certain manuscripts submitted to the journal. Hayes said the request for Hammond's help was also "on behalf of Professor Goodman." The email communications show numerous interactions between Monsanto officials and Goodman as Goodman worked to deflect various criticisms of GMOs. The emails cover a range of topics, including Goodman's request for Monsanto's input on a Sri Lankan study submitted to FCT; his opposition to another study that found harmful impacts from a Monsanto GMO corn; and project funding from Monsanto and other biotech crop companies that makes up roughly half of Goodman's salary. Indeed, an October 2012 email exchange shows that around the time Goodman was signing on to the FCT journal and criticizing the Seralini study, Goodman was also expressing concern to his industry funders about protecting his income stream as a "soft-money professor." In an October 6, 2014 email, Goodman wrote to Monsanto Food Safety Scientific Affairs Lead John Vicini to say that he was reviewing an "anti-paper" and hoped for some guidance. The paper in question cited a 2014 report from Sri Lanka about a "possible exposure/correlation and a proposed mechanism for glyphosate toxicity related to kidney disease." Glyphosate is the key ingredient in Monsanto's Roundup herbicide and is used on Roundup Ready genetically engineered crops. The World Health Organization in 2015 said glyphosate was a probable human carcinogen after several scientific studies linked it to cancer. But Monsanto maintains glyphosate is safe. In the email to Vicini, Goodman said he did not have the expertise needed and asked for Monsanto to provide "some sound scientific arguments for why this is or is not plausible." The emails show other examples of Goodman's deference to Monsanto. As the Le Monde article points out, In May 2012, after the publication of certain comments by Goodman in an article on a website affiliate with the celebrity Oprah Winfrey, Goodman is confronted by a Monsanto official for "leaving a reader thinking that we really don't know enough about these products to say if they are 'safe.'" Goodman then wrote to individuals at Monsanto, DuPont, Syngenta, BASF and Dow and Bayer and apologized "to you and all of your companies," saying he was misquoted and misunderstood. Later in one July 30, 2012 email, Goodman notified officials at Monsanto, Bayer, DuPont, Syngenta and BASF that he has been asked to do an interview with National Public Radio about whether or not there is a relationship between GMO crops and increasing food allergies. In an Aug 1, 2012 reply, an official at Bayer offered him free "media training" before his interview. The emails also show Goodman's collaborative work with Monsanto to try to defeat GMO labeling efforts. In one October 25, 2014 email to Monsanto chief of global scientific affairs Eric Sachs and Vicini, Goodman suggests some "concepts and ideas" for advertisements that can educate "consumers/voters." He wrote that it was important to convey the "complexity of our food supplies" and how mandatory labeling could add to costs if companies responded by sourcing more non-GMO commodities. He wrote of the importance of conveying those ideas to the Senate and the House, and his hope that "the labeling campaigns fail." The emails also make clear that Goodman depends heavily on financial support from St. Louis-based Monsanto and other biotech agricultural companies who provide funding for an "Allergen Database" overseen by Goodman and run through the Food Allergy Research and Resource Program at the University of Nebraska. A look at the sponsorship agreement for the allergen database for 2013 showed that each of six sponsoring companies were to pay roughly $51,000 for a total budget of $308,154 for that year. Each sponsor then can "contribute their knowledge to this important process," the agreement stated. From 2004-2015, along with Monsanto, the sponsoring companies included Dow AgroSciences, Syngenta, DuPont's Pioneer Hi-Bred International, Bayer CropScience and BASF. One 2012 invoice to Monsanto for the Food Allergen Database requested payment of $38,666.50. The purpose of the database is aimed at "assessing the safety of proteins that may be introduced into foods through genetic engineering or through food processing methods." The potential for unintended allergens in some genetically engineered foods is one of the common fears expressed by consumer groups and some health and medical experts. "GMO safety is hardly proven, not to the level a healthcare provider should feel ok with for all their patients," said Ashley Koff, RD, a nutrition expert who favors mandatory GMO labeling. In comments on the House floor, Rep. Jim McGovern (D-Mass.) said the QR codes were a gift to a food industry seeking to hide information from consumers. The law is "not what's in the interest of the American consumer, but what a few special interests want," he said. 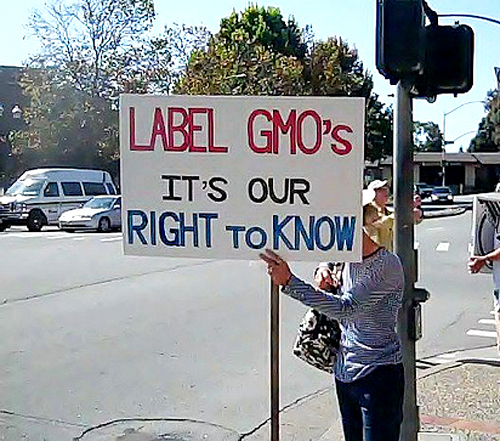 "Every American has a fundamental right to know what's in the food they eat." Goodman, Monsanto and others in the biotech ag industry can celebrate their win in Congress but the new labeling law is likely to only breed more consumer skepticism about GMOs given the fact that it negates the type of transparency consumers seek - just a few simple words if a product is "made with genetic engineering." Hiding behind a QR code does not inspire confidence.